My dear friend, Dawn DeVries Sokol just came out with a new book. 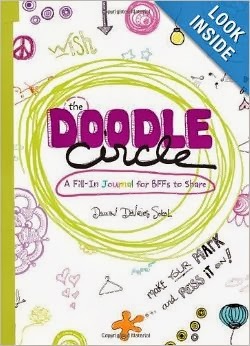 It's called Doodle Circle: a fill in journal for BFF's to share. Let me first say that the pages are absolutely LUSH! Who wouldn't want to create, doodle and explore on these pages. I love that they aren't blank so you are inspired each visit to your journal. The color brings you in. The textures invite you to play....and the prompts keep you coming back for more! One of my favorite prompts/pages is "What's in a name" If you could change your name to anything else, what would it be and why? Doodle it out here and make it look fancy. I just love this. When I was a kid I wanted to change my name to Molly. no idea why.....LOL! This book looks great - I loved Dawn's previous doodle book! Mindy, why on earth did you want to be Molly?! Thanks for participating in the bloghop giveaway! I like the name Molly. :) When I was a kid, I wanted to be named Julie. When my daughter was born, I named her Julie Ann. She decided at age 9 that she liked Betsy better. And Betsy she still is at age 27!! Go figure.... lol. Names are often perceived to be wrong. My birth name was changed from day one...and I've always been Jo. The bank hates it as there is no provision for a 'nickname' and I often get cheques made out to 'Jo' Anyways, I can always dream that I'm someone exotic...like Juanita, or even Sunflower. Hmmm...I need that book to explore this.